If you're looking for the best New Orleans gifts, we can guarantee we have something for every person on your list here. We've got over 20 ideas to choose from. Some gifts are funny, some are classy, most are sassy, and all are infused with that NOLA spirit. Many are made by local New Orleans artisans and we've broken down our favorites by price, so ya'll can find the best options for your budget. Ready to get shopping? Whether you're looking for a Secret Santa gift or a quick pick-me-up for someone who's missing home, these gifts are sure to please. Treat dem to some purple and gold pasta that's ready for tailgating. This pack comes with three recipes and a vinaigrette mix so you can make the perfect Game Day pasta salad. Let's make Mondays a bit sweeter with this awesome treat. These candy red beans and rice are made locally by Southern Candymakers and feature candy-coated "red beans" and chocolate covered sunflower seeds. We're talkin' comfort, we're talkin' self-care, we're talkin' some of the best sweets you can soak in. Made by the fantastic local artisans at Crescent City Swoon, these snoball bath bombs create the most decadent and luxurious bath. They're loaded with cocoa and shea butter, finished off with virgin coconut oil, and scented with classic cherry, lime, and mango. Seriously, what are you waiting for? Get dat! The sweetest touches can make the biggest impact. These earrings come in a little corked bottle, so you can send them a piece of home wherever they're at. For fun and affordable New Orleans gifts made by a ton of fantastic local artisans, look no further. Inspire that Southern cooking with this NOLA kitchen towel. It's made from environmentally-friendly 100% organic cotton and machine washable. When you need some of dat snow and dough in your life, this is the perfect beignet-scented candle. It smells just like walking past Café du Monde in the French Quarter. We won't judge if you leave it burning pretty much all day. Candle is made locally by Southern Firefly Candle Co. from 100% soy wax, an eco-friendly and sustainable product. In New Orleans, you bet we're all about that shine. Wear your love close to your heart with this modern and minimal NOLA necklace. Comes with a 17" chain, and it's available in both silver and gold (but we happen to think gold goes with everything). Ya'll, there are few items more NOLA than this colorful, playful "Let It Sneaux" towel. It really deserves to be hung up the whole year. Summer for sno balls; winter because, well, this is about as close as we're gettin' to a white Christmas. The fleur de lis is a classic and always classy symbol for New Orleans. Beautifully minimal, these stone coasters are super absorbent for hot and cold weather drinks. Get yours now in a set of four. Each are 4x4" in size. New Orleans is a city steeped in history, where even the water meters are iconic. Created in the early 1920s by Edwin Ford with a unique Art Deco design, these have all the splash and sass New Orleans is known for. This takes that design and turns it into a fun and functional New Orleans gift that your loved ones will adore. Use it to protect countertops from hot (gumbo) pots or hang it when not in use for cute wall art. Inspired by New Orleans’ 300th birthday (but, gawd, don't she still look great? ), this platter is the perfect place to showcase your jewelry or place your keys at the end of a long day. Printed with a metallic gold map, this platter is 13x7". Bring the classic New Orleans streetcar home with this beautiful apron. Apron is made from 100% cotton and is fully adjustable. Carry that Crescent City color with y'all wherever you end up. This vibrant print is made from canvas and ready to hang. Size is 12x4 inches. We know ya'll are just a bit extra. For those fancier gifts and splurges, we got you. Found on New Orleans street corners since the 1880s, these unique blue and white tiles are part of what make NOLA home. No matter where ya'll at, you can bring that little bit of home with you wherever you go. This one-of-a-kind New Orleans necklace comes on a 24" chain in antique silver. For the nerd who has everything, bring a smile to their face with this unabashedly Southern t-shirt. Made from 50% polyester, 25% rayon, and 25% cotton in crew neck. Crawfish, tubas, and gumbo, oh my! Made by a local artist, Allie Behand, this print captures some of the most magical parts of the Crescent City. Hang it on your wall, loud and proud. Size is 11x14". This is one of our best-selling New Orleans t-shirts, and for good reason. Who doesn't love that sweet snowy smile?! Get dem now in all sizes. Whether you're sidewalk side or neutral ground side, show allegiance to your Mardi Gras place to be all year long. We've got Mardi Gras shirts for the big'ns and lil' bits, in crew and V-neck options, so you can outfit the whole family. The Crescent City gets its name from that unique swoop of the Mississippi River. Know someone who left their heart in that dip? Gift them this golden beacon to cure their heartsickness. This shiny print comes ready to hang. For your favorite lil’ bits, don't miss out on this utterly cute kid's crawfish kit. The crawfish boil is a time-honored part of growing up NOLA. Get dem started early with their own boil seasoning and crawfish kit. Crawfish, gumbo, and po-boys, what more could you want? Gift dem the yummiest parts of the Crescent City with this Fleurty Girl original. This is a local New Orleans gift that is sure to be loved and used often. This NOLA cutting board is made from bamboo and is 15 ¾” by 12” in size. For one of the most iconic and thoughtful New Orleans gifts, look no further than this customizable wall art. The blue and white tiles have graced the streets of the French Quarter since the 1880s. Today, local artisans like Danny Chinn at Preservation Tile create these historic tiles using the same time-honored techniques. Choose a name, date, or saying that's between three to twelve tiles long for a one-of-a-kind gift. We ship them out ready to hang in hand-painted frames. 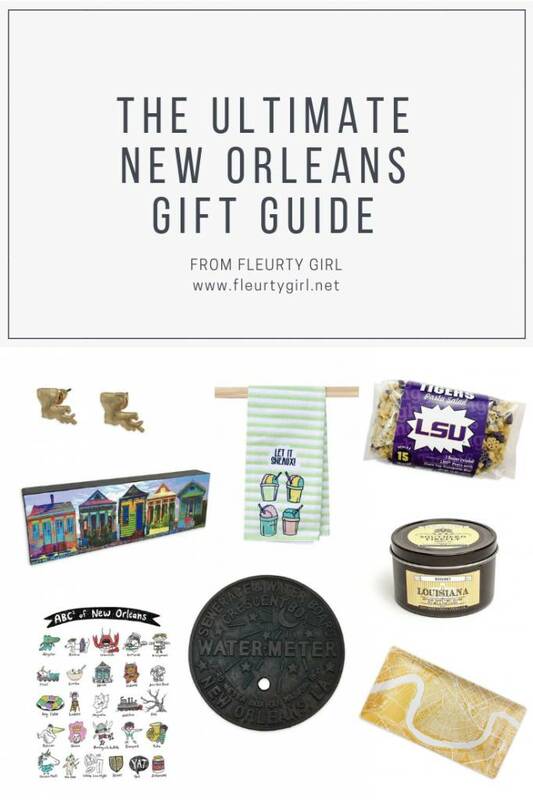 If you're local, come on by to Fleurty Girl to shop all of our New Orleans gifts. Too far? You can get all of our New Orleans gifts online now.